Every element of a good resume should put itself under the microscope of this question. If you’re including information that the employer doesn’t care about, you’re wasting that person’s time, which means your resume will quickly end up in the recycling bin. How can you know what an employer is looking for? Start with some good old fashioned research. Put together a market profile by collecting 5-10 job posts for positions that interest you (I recommend 10 if possible). Note what elements are repeated from post to post. Those are your keywords. Pay attention to aspects like skills, certification, and education. Taking a little time up front will let you know what the employer wants, which should be the first step in writing a resume that gets you noticed. Former Labor Secretary Robert Reich has put forth a big proposal: unionizing workers at McDonalds, Walmart, and large hospitals that currently don’t have unions. Reich’s real concern isn’t union growth so much as it is finding a way to deal with growing poverty and lost income in the U.S. It’s not just the least among us who are suffering. Reich cites a study that shows the bottom 90% of American wage earners lost 1.2% between 2009-2011. He tracks the rise in worker income in the 1950s and its decline since the 1970s to the rise and fall of union membership. Workers are losing. Who has been winning this game? The most wealthy Americans, the same people who attack unions and the poor. Reich argues that a country with more evenly distributed wealthy would help all Americans. Unfortunately, too many people don’t share his view. We live in an “I got mine and I want more” culture. Until that changes, expect more of the same. P.S. : Writing in Think Progress, Pat Garofalo reports that nearly 50% of Americans are one financial misfortune away from poverty. Unions would help make our society more stable and secure. Of course, so many Americans have been bamboozled by the corporate media to believe in a “freedom” that leaves them at risk and makes only the super rich more secure. 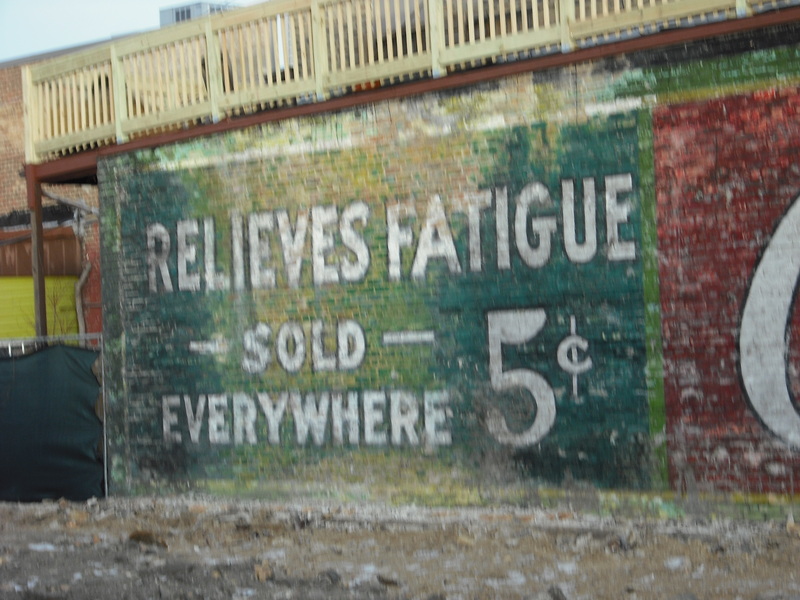 People who love urban spaces are often fascinated by ghost ads, faded wall paintings advertising a company long gone or a product that no longer exists. 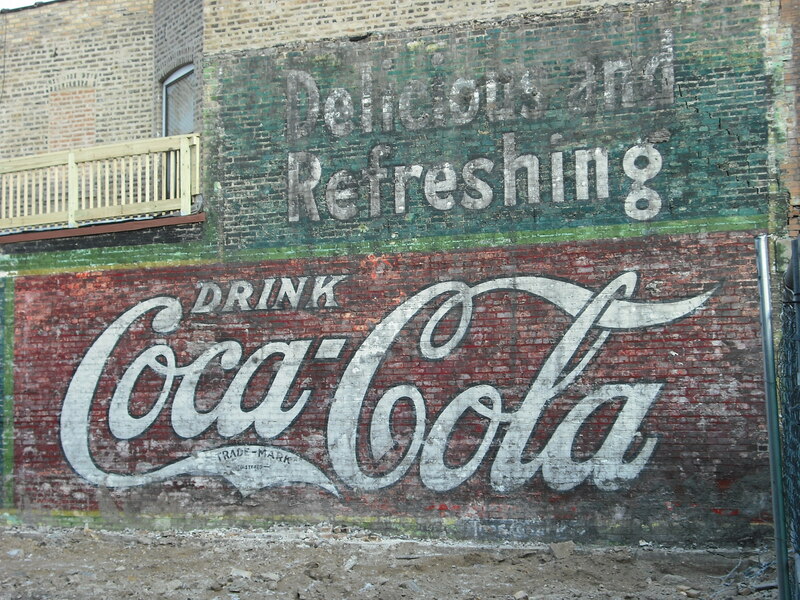 In my neighborhood, we had something of a ghost ad wonder, a full wall that pitched a well-known brand, Coke. When a building was torn down a few months ago, the ad was revealed. Sadly, progress being progress, it will soon be covered as a new building goes up in the space. Why is this ghost ad significant? First, its quality is so good that it’s almost a time machine that takes us back to the 1920s or 1930s. Second, it pitches the product as an energy drink of its time, something that “relieves fatigue.” Finally, it tells us that Coke only cost 5 cents when the ad was paint. 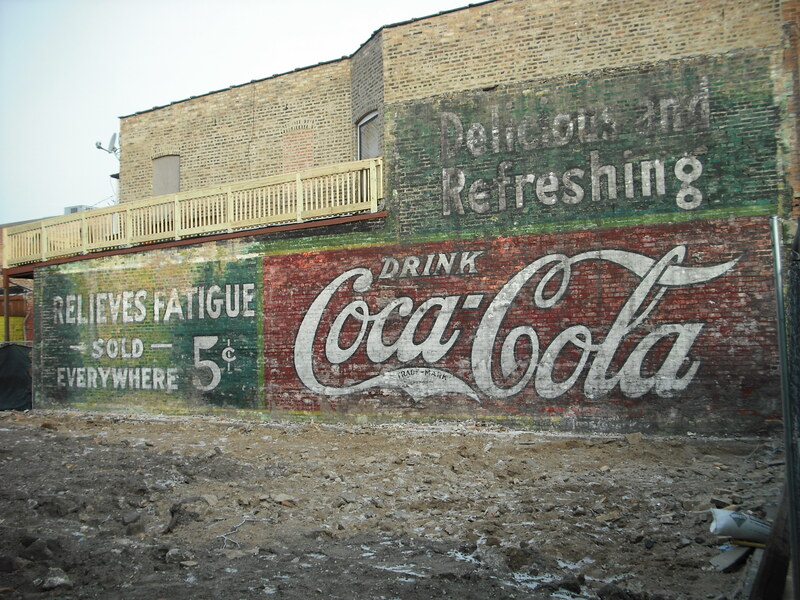 Coke used that price for several years from 1886 through the boom of the 1920s through the Depression bust to the last nickel Coke, which was sold in 1959. Signs like this one forced retailers to adhere to the manufacturer’s pricing model. In Daily Kos, Laura Clawson reports that Hyatt has settled a case with two workers it tried to fire for attempting to organize a union. It’s not a grand victory. But given recent court decisions and the GOP war on labor, it’s a victory. We need more. Want More Money? Look for a New Job. I presented at a career fair yesterday and learned many great strategies and tactics that I’ll be sharing in the blog over the next few days. Here’s a great one from a recruiter: If you want more money, find a new employer. For most workers, raises have been small or none over the last few years. In some cases, employees have even faced pay cuts. The best way in this economy to get a bigger piece of the pie is to find a new employer, one that needs your skill and will pay you more. The job search is never easy, but it can be the best way to get a raise in the current job market. Huffington Post offers a short, but insightful article by Steve Tobak of Inc. The premise is simple – 9 sentences that could kill your career, which grabs our attention. The real advice is to communicate professionally in an office environment. Don’t discuss topics that can lead to arguments. Don’t gossip. Don’t spread rumors or bad news that has nothing to do with your job. I especially like Tobak’s last point: Don’t put in writing. Think before you speak, and remember that you’re at work. What you say has consequences, and it can be used against you. Saying the right thing is an important part of career management. King used the word we, a word often invoked in the president’s speech today. Let’s hope that this country can come together, and work together, to see that we all rise up – together. Writing in Daily Kos¸ Meteor Blades reports that our focus on more jobs may be missing a bigger problem. The economy has added jobs. The problem is that more and more of them tend to be part-time or paid at lower wages. Blades cites a this eye-popping statistic: In 2008 4.7 million Americans were employed part-time. That number is now, just five years later, 7.8 million. Even more shocking, the retail industry has cut one million jobs since 2006 and only added 500,000 part-time jobs. Recent economic news has sounded good: more people working, improved housing market, and more factory orders. None of this happy talk will matter if employees keep getting squeezed on income. My clients tend to be professionals with college degrees. Over the last year too many to count have told stories of going 3-5 years with no increase in pay. If this continues, the chickens will come to roost. Mark Gongloff of Huffington Post reports that Lloyd Blankfein, head of Goldman Sachs, is getting a 75% raise. Normally, I would try to make snarky comments here. However, I cannot match Gongloff’s skill in putting this news in its proper context. I urge you to read his article and enjoy his skill at describing the absurd. I was working with a client in sales today who has worked in the field for more than 20 years. He gave me a good way of thinking about companies that only offer employees 100% commission as a starting salary: What are they investing in you? If a company has no investment in new employees, it can lay them off with no pay. Leaders in his industry offer base commission in the $20,000-$30,000 range. That base disappears after two or three years, and a good sales professional will be happy to work on 100% after that time because she will have built a good book of business. Beware of any company that does not offer a base. Ask yourself, What are they investing in me?